Although the miniatures have had an appeal since their release, it took me until late least year to finally get a set of Goff Rockers painted. While I was quite pleased when I finished painting those disciples of rock, Mushrööm Klöwd was still missing a few things, a drummer at the very least. 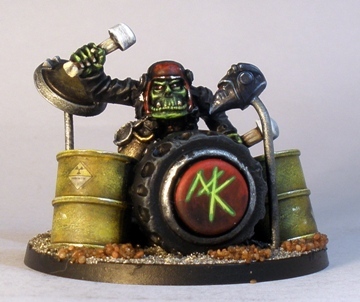 I could have used a fantasy orc musician to turn the Klöwd into a four piece, but I wanted to use an ork model, rather than an orc model. 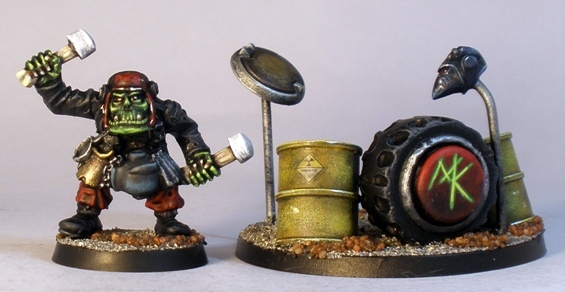 I sniffed around the various forums for an old Rogue Trader era ork drummer for a while, but to no avail. So I reluctantly coughed up for one on Ebay. The musician model was designed with a number of different percussive instruments hanging about his person: a frying pan, a piece of corrugated iron, an Imperial Guardsmans helmet, that sort of thing. Thats fine if the model is to be used in a regular footslogger capacity in games – which it will also be – but it isnt stadium rock enough for when the green guy moonlights with the Klöwd. So I decided to throw together a very simple drum kit out of some pieces lying around. The drum kit was made from a wheel from Ramshackle Games, a pair of model oil drums that were stuck to the display base of a Batmobile toy that came on the front of a magazine, a tiddlywink, a Tau shield generator, a paperclip and an old RTB01 marine helmet (added for a little retro cred). While the this sub-project could easily be declared finished right now, I plan to add at least one more model to the line-up in the not too distant future. That is, unless someone reading this can point me in the direction of a sci-fi 28mm ork miniature with a keyboard or keytar/gitboard, in which case I will add at least two miniatures to finish these guys off. Great!!!!! I need these in my life. Im glad that you like them AMAHT. Even better news is that the Goff Rockers are currently available from the GW website and for relatively little cost by GW standards. So there is nothing stopping you from getting your own miniature ork band together :). Awesome. Good idea and better execution. Awesome rockers. Have you thought about customising the Blood Bowl orc cheerleader as a groupie? They look absolutely fantastic together. It amused me that I picked up that very same drummer for exactly the same reason some months ago. But my Goffikk Rokkerz are still sat in my lead pile waiting to get a lick of paint. I have another pair of models left to add to the Klöwd before I declare them finished, before they end up Arcade Fire sized. Make sure that you post a link here when you get your rockers painted. This is defiantly the best use of Goff rockers! lol . Awesome Dead Kennedys reference “MK” , and the beak Marine crash cymbal is very cool and last i like the radioactive detail sticker on the drum! Good stuff! hope you find that key-tar player . I’m glad that you like them von gut en boom, The Klöwd have been a lot of fun to put together.